The Pediatric Noodle® carbon fiber composite ankle foot orthosis is a lightweight yet extremely durable AFO. It is ideal for users with varying degrees of foot drop who would benefit from a dynamic, energy-storing AFO to improve gait. The flexible footplate and flexible strut facilitate a more natural gait than more rigid carbon fiber AFOs. The Pediatric Noodle AFO provides gait assistance by controlling plantar flexion and reducing energy consumption with dynamic dorsiflexion and improved loading response. The Pediatric Noodle is handcrafted by expert technicians skilled in carbon fiber composite fabrication. This allows for a custom precision fit that optimizes performance and efficacy. The Noodle is available in either Off-the-Shelf, Build-to-Order or Custom-from-Cast models. Off-the-Shelf Standard Size Models: The footplate can be pre-cut to an exact size at no extra charge. Build-to-Order Models: Specifications include: cuff height and footplate length variations; strut variation from flexible to extra-stiff; footplate variation from flexible to extra-stiff; colors or user supplied fabric. Custom-from-Cast Models: For difficult to fit users. Carbon fiber orthopedic braces from Kinetic Research’s patented products are lighter, stronger and more flexible than standard carbon fiber braces. The key is dynamic flexibility that absorbs and releases kinetic energy. The Noodle flexes and absorbs weight loads well past the point where standard carbon fiber braces fail and break. 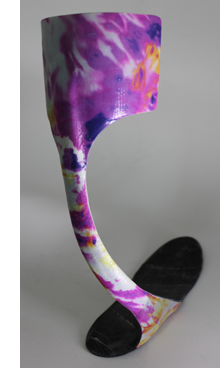 Kinetic Research was the first to apply resin sheets and fiber braids in orthotics and prosthetics fabrication. This led to the ReadyPreg® and Ultra-G® lines of materials. Now Kinetic Research has combined ReadyPreg® and Ultra-G® into a patent-pending process called Fusion. 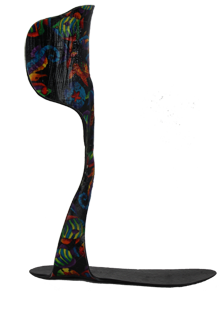 The Fusion process is the state-of-the-art in carbon fiber composite technology for orthotics & prosthetics fabrication. The Noodle TA’s rigid anterior shell helps stabilize and extend the knee. Pre-set in two degrees of plantar flexion, the Noodle TA absorbs kinetic energy during the mid through terminal stance phase of gait. That energy is released through the footplate at push-off creating a more natural gait pattern for users that have lost plantar flexion strength. The lateral noodle strut connects with the footplate proximal to the base of the #5 Met Head. 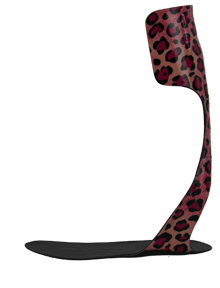 This virtually eliminates the uncomfortable contact between the bone and the strut. Mild to moderate knee extension weakness: The Noodle Plus applies a floor reaction force to the upper tibia. This helps with knee control and extension. Foot/ankle plantar flexion weakness:The Noodle Plus absorbs kinetic energy during the middle and end of the stance phase of the gait cycle. The energy stored is then released at push/toe-off with every step. Post Tibial Tendonitis Dysfunction (PTTD): The Noodle Plus limits the anterior progression of the tibia which is effective in reducing forces that cause midfoot collapse. It is used in conjunction with foot orthotics to reduce pain and swelling caused by the combination of a tight Achilles tendon, midfoot collapse during the late stages of gait and tendonitis/arthritis associated with the condition. Partial foot amputation:The Noodle Plus is a lightweight option for mid and distal partial foot prosthetic needs. The energy-storing effect and simulated push-off is ideal for this application. Add a custom insole and shoe filler for a complete solution. The ValgaNoodle AFO is a new approach to an old orthopedic dilemma. One of the most difficult deformities to address effectively with bracing is ankle and foot varus. In the past, bulky and cumbersome devices would attempt to lock the user’s foot into a static position. The ValgaNoodle AFO uses a dynamic three-point system that moves with the user’s body while applying a constant corrective valgus force. The ValgaNoodle AFO is only available custom-from-cast. The casts are corrected to a more normal foot position and the AFO is fabricated in the improved position. The dynamic properties allow the user to easily don and doff the device. Once applied it creates a constant valgus force designed to improve positioning. The dynamic lateral control coupled with a dynamic footplate leads to more confident and natural gait. Dr. Janet Dufek is an associate professor and co-director of the Biomechanics Laboratory at the University of Nevada, Las Vegas. Dr. Dufek’s research focuses on lower extremity function. In collaboration with faculty in engineering, nursing, and physical therapy, her interdisciplinary research addresses issues including child obesity, effectiveness of physical therapy interventions and prosthetic appliances, and aging-related issues. In addition to her academic position, Dr. Dufek is a research scientist with HPW Biomechanics, where she directs research projects related to evaluation of footwear and exercise equipment. Dr. Dufek is a Fellow of the American College of Sports Medicine and the Research Consortium of the American Alliance of Health, Physical Education, Recreation and Dance; the American Society of Biomechanics; and Southwest Regional Chapter of the American College of Sports Medicine. Her research interests include gait adaptations/balance, lower extremity function, injury prevention mechanisms, variability and human performance, single subject methodology. She has published numerous research papers, a few of which are listed below. Liebenberg, J., Scharf, J., Forrest, D., Dufek, J.S., Masumoto, K., & Mercer, J.A. Determination of muscle activity during running at reduced body weight. Journal of Sports Sciences. 2011;29:207-214, doi 10.1080/02640414.2010.534806. Whitley, C.R. & Dufek, J.S. The effect of retro-walking on hamstring flexibility and low back range of motion. International Journal of Exercise Science. 2011;4(3):192-198. Candela, L., Gutierrez, A.P. Dufek, J.S, Mercer, J.A., & Putney, L.G. Modifying the Diabetes Prevention Program to adolescents in a school setting: A feasibility study. International Scholarly Research Network: Nursing. 2012, Article ID 534085, 9 pages, doi:10/5402/2012/534085. Dufek, J.S, Currie, R., Gouws, P.L., Candela, L., Gutierrez, A.P., Mercer, J.A., & Putney, L.G. Effects of overweight and obesity on walking characteristics in adolescents. Human Movement Science, 2012;31:897-906, doi:10,1016/j.humov.2011.10.003. Santo, A.S., Roper, J.L., Dufek, J.S. & Mercer, J.A. Rocker-bottom, profile-type shoes do not increase lower extremity muscle activity and energy cost of walking. Journal of Strength and Conditioning Research. 2012;26(9):2426-2431. Forrest, D.M., Dufek, J.S. & Mercer, J.A. Impact characteristics of children running in adult sized shoes. Journal of Applied Biomechanics. 2012;28:593-598. Delgado, T.L., Kubera-Shelton, E., Robb, R.R., Hickman, R., Wallmann, H.W. & Dufek, J.S. Effects of foot strike on low back posture, shock attenuation, and comfort in running. Medicine and Science in Sports and Exercise. Published Ahead of Print, DOI: 10.1249/MSS.0b013e3182781b2c. Ryan-Wenger, N.A. & Dufek, J.S. An interdisciplinary research model of pediatric patient falls and fall-related injuries. International Journal for Quality in Health Care (in press). Bates, B.T., James, C.R. & Dufek, J.S. (2003). Single subject analysis. In N. Stergiou (Ed. ), Innovative Analyses of Human Movement (pp. 3-28). Champaign, IL: Human Kinetics. The federal government gives matching funds to states to provide the coverage, but that funding is set to end in September 2015, on the assumption that most beneficiaries will be able to get subsidized private coverage through the insurance exchanges created under the health care law. The federal government pays most of the $13 billion annual cost for CHIP. But advocacy groups are warning that exchange plans will prove unaffordable for many households with children, partly because a quirk in the law prevents families from getting subsidies if a parent is offered “affordable” coverage at work. The law considers premiums on employer-based plans unaffordable if they exceed 9.5 percent of household income, but in what has become known as the “family glitch,” that standard applies only to premium costs for individual plans — not to family plans. Another concern is that families will face more out-of-pocket costs for exchange plans, and that such plans will offer a narrower set of benefits for children. A recent analysis by the Wakely Consulting Group found that many families would need to spend substantially more out of pocket to get the same care through an exchange plan that they get through CHIP. So far, only 6 percent of enrollees in the new exchanges are younger than 18, according to the Health Policy Center at the Urban Institute. Far more children are enrolled in Medicaid than either CHIP or the exchange plans, including many who became newly eligible for Medicaid under the Affordable Care Act. Senator Jay Rockefeller, Democrat of West Virginia, and Representative Henry A. Waxman, Democrat of California, have introduced bills that would extend federal funding for the program through 2019. But the Medicaid and CHIP Payment and Access Commission, an advisory group, has recommended only a two-year extension, saying that would be long enough to address problems like the law’s family glitch. Mr. Rockefeller, one of the original architects of the program, who is retiring at the end of this year, said he worried that even with broad support, the program could get caught up in a political fight. “You can’t always count on something that has been bipartisan to continue to be bipartisan,” he said during the hearing. Cathy Caldwell, the director of Alabama’s Children’s Health Insurance Program, testified that her state was “already dealing with issues related to the uncertainty of CHIP funding” as it prepared a budget for the 2016 fiscal year. Ronald Pollack, the executive director of Families USA, a liberal-leaning consumer group, said that while he saw “encouraging signs” that the program’s funding would be extended, he worried it could be thwarted by congressional gridlock. A version of this article appears in print on Sept. 17, 2014, on page A18 of the New York edition with the headline: Fate of Children’s Insurance Program Is Called into Question at Senate Hearing. Saying that electronic health records distract doctors, take time away from care and make physicians less productive, an influential doctors’ group called on vendors and government agencies to work with them to develop better, easier-to-use technology. The American Medical Association asked the Obama administration to abandon its “all or nothing approach” requiring Medicare providers to go digital or be penalized. The group also wants the government to develop better certification criteria for vendors selling electronic record systems. It outlined eight areas for overhauling the record systems, with the top priority being to make sure the technology enhances, rather than disrupts patient care. Electronic health records should also promote coordination, enable physicians to delegate to other health care providers and be able to interact with patients’ mobile devices. Under the 2009 economic stimulus package, Congress authorized $27.4 billion to incentivize doctors to switch from paper to electronic records with the goal of reducing costly errors and duplication and boosting coordination. The law offers doctors who treat Medicare patients up to $63,750 over five years to help pay for the change if they can prove they’re making “meaningful use” of the systems by, say, submitting prescriptions electronically. Those who do not go digital are supposed to have a percentage of their Medicare payments withheld beginning next year. However, the government recently agreed to give certain providers more time and flexibility. The AMA says that isn’t sufficient to address the problems. The group said that one of physicians’ chief concerns is that the programs often have clunky menus that require what it called “the collection of time-consuming information of questionable value” and data that is no more than “clutter,” such as lists that do not differentiate between a patient’s current and out-of-date medications. That information distracts the physician, is often irrelevant to the care of the patient and leads to “excessive clicking and scrolling” on behalf of the doctor, the organization said. Asked whether they’re seeking delays to the programs penalties beginning next year, Stack said that’s not the group’s goal. “We would not shy away from accepting delays but have not made that our focus,” he said. In addition to the criticisms laid out Tuesday, the AMA had joined with the American Hospital Association and 15 other groups to ask the administration to let providers show meaningful use of electronic health records for three months in 2015, as opposed to a full year — arguing the program’s success hinges on the agency offering flexibility. A spokesman for the Obama administration encouraged doctors to communicate what they need to vendors and others. “We support the AMA’s efforts to improve EHRs for the end user – the health care providers who use these products to treat their patients,” said Peter Ashkenaz, spokesman for the Office of the National Coordinator for Health Information Technology at the Department of Health & Human Services. Please feel free to submit your questions on the Pediatric Noodle® AFO from Kinetic Research as well as any other issue you would like addressed.